Riccardo ESE, by Rubignon, out of EM Lucia, by Liberty Gold x Donnerschall...NOW STARTED UNDER SADDLE! Riccardo ESE is by Grand Prix Dressage Stallion Rubignon, and out of the Elite Hanoverian Mare Lucia ESE, by Liberty Gold/Donnerschall/Wilhelm Tell II. We are asking $25,000 for this elegant and talented young boy. 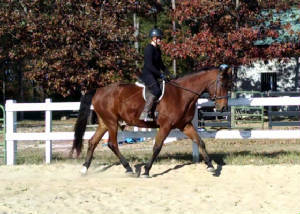 Price will go up when he is started...he wil be a very fancy hunter, or an outstanding Dressage horse!